Crash, bang, wallop what a show, they don’t come any bigger than the full-on assault on the senses that is the annual King’s Theatre pantomime, which next year celebrates a 50 year unbroken run of festive shows. With a roster of Scottish acting and comedy talent and a storyline tailor-made for the Glasgow audience this is a year-on-year sell-out success and a long-held tradition with Glaswegian families. 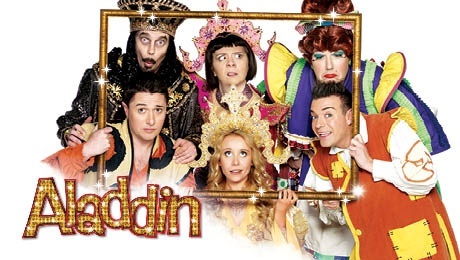 This year the story receiving the King’s treatment is Aladdin which, apart from some local in-jokes and the inevitable pop culture references for the tweenies, sticks to the traditional pantomime version of the story. The success of any festive show is dependent on the strength of its actors and with a plot as holey as Widow Twankey’s capacious drawers; the casting of Scottish comedy icons Karen Dunbar (Mrs. McConkey/The Genie of the Ring), Des Clarke (Wishee Washee) and Gavin Mitchell (Abanazar) is inspired. The sublime comedy skills of the trio are the glue that binds the whole thing together. Dunbar, in particular is a star; a woman who merely needs to raise an eyebrow or flare a nostril to have an audience in stitches, that she is also in possession of a belter of a voice is a fabulous bonus. Mitchell is also in top form as evil baddie Abanazar; giving his best Tim Curry à la Rocky Horror voice and the best “Mwa ha ha” evil laugh you’ll hear in years. As the titular character Kieran Brown has little to do apart from a magic carpet riding rendition of Jackie Wilson’s ‘Higher and Higher’ and a few bits of fluff, as has Jenny Douglas, under-used as Princess Jasmine. The pair are highly gifted performers both in possession of first class musical theatre voices but here we only get glimpses of the talent underneath. The sets and costumes too, are stars in themselves; no expense has been spared in their design and construction and they read supremely well on stage; the word stunning simply doesn’t do them justice. This is everything a Christmas show should be, with plenty for both adults and kids alike: there’s sparkle and pizzazz, there’s music and dancing, sing-a-longs and slapstick and the highlights more than make up for the sometimes saggy plot. With Aladdin, the King’s upholds its long held position as the number one pantomime in Glasgow.